Marriages are social occasions that are celebrated with grandeur. But the people falling under the poverty level find it difficult to gather necessary funds to arrange the marriage ceremony. To assist these families, the state government of Up has come up with a new scheme called the Mukhyamantri Samuhik Vivah Yojana. The project is targeted towards providing financial assistance to the selected brides and arranges collective marriage ceremonies, under the watch of the government departments, in various areas in the state. The announcement of the scheme has been done by the Chief Minister of the state in mid-2017. Yogi Adityanath is known for implementing many welfare schemes for improving the condition of the poor and needy masses. It is another step towards this and will be looked after by the Social Welfare Department of Uttar Pradesh. Empowering the poor – The main motive of the scheme is to empower and assist the poor people. With the financial aid, these families will be able to meet the expenses of the marriage ceremony. Reducing the cost of marriage – Another key aspect of the scheme is that the state government will organize collective marriage ceremonies. Here, many couples will be married at the same time, thus, lowering the overall expense for the authority. Monetary grant to the bride – It has been declared that each selected bride get Rs. 20,000 individually. This amount will be deposited in the bank account of the bride. Additional amount for the marriage – The marriage organizing authority will spent an addition Rs. 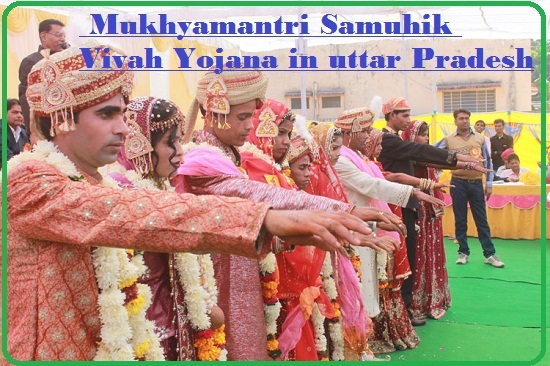 35,000 on each and every couple to be wedded in the Samuhik Vivah ceremony. Money for the bride’s dress – The money that the state will spent on each couple will include Rs. 10000 that is specifically meant for purchasing the wedding dress of the bride. Mobile phone and other accessories – The state will also provide the couple with new smart phones and household utensils as a gift for the wedding. Along with these, some other accessories will be given. Number of couples – The scheme draft highlights that the organization of the collective marriage ceremony will take place once the organizations manages to get a minimum of 5 to 10 couples. Number of beneficiaries – Once the project is run; it will assist the families of 71,400 brides in meeting the expenses of marriage adequately. Brides living in rural as well as urban areas will be allowed to get the benefits. Categories included under the scheme – For the time being, the total number of candidates the scheme caters to will include, ST, SC, OBC, minority and general groups as well. 30% ST/SC candidates, 35% OBC, 20% general and 15% candidates from minority communities will be selected. Organizing the ceremony – The collective marriage ceremony will be organized by the officers of Nagar Palika, Nagar panchayat, and Nagar Nigam. They will be assisted by NGOs accordingly. State sponsored scheme – The responsibility of looking after the finances of the project is only on the state government of Uttar Pradesh. All funds will be generated by the state. Must be residents of UP – To acquire the monetary grant from the state government, the applicant must stay within the borders of Uttar Pradesh. The couple must be residents of the state. Must be above 18 years – The government aims at reducing the instances of marriage of minor girls. Thus, the money will be given to those candidates who have already completed the age of 18 years. Must have BPL certificate – As the empowerment of the poor strata is the primary aim of the project, the interested candidate must have access to Below Poverty Level certificate. Without this, the application will be rejected. Income related eligibility – The candidates from villages as well as the cities will be able to get the benefits. The family income of a candidate must not exceed the Rs. 46,080 and Rs. 56,460 for rural and urban areas respectively. 5 to 10 couples at least – The mass marriages will be organized by the state authority of the respective areas, if they are able to gather a minimum of 5 couples. Earlier the minimum number was 10. Divorcee and widows – If all other requirements are fulfilled, the scheme will also allow the candidates to acquire the benefits who are either divorced or their husbands have passed away. Residential proof – As only the people living in the state will be allowed to get the benefits of the scheme, they need to possess proper domicile or residential documents. Address proof is a must for registration. Aadhar card of the bride – The interested candidates must have access to the Aadhar code. Without the Aadhar Card, their registration will not be accepted. Age proof of the candidate – The main aim of the state is the eliminate under-age marriages. Thus, proper age proof like the birth certificate must be attached with the registration form. BPL certificate – The program will provide respite to poor families from the financial worries. Thus, attaching the BPL certificate is a must during the registration of the application. Family income certificate – Due to the income related criterion, the candidate will have to provide proper income certificate along with the application form. These will be verified by the state authority. Marriage documents – To get the benefits under the program, the couples have to attach copies of their marriage registration certificate. It will support the claim that they are marrying. Bank account details – As the grant amount will be transferred in the respective bank account of the candidate, the possession of one is a must. The form must also contain all details of the bank account. The state government has already announced the budget and has made necessary allocations. The Finance Minister of Uttar Pradesh, Mr. Rajesh Agarwal has announced that for the successful implementation of the Samuhik Vivah Yojana, the state authority has allocated a whopping sum of 250 crores. The implementation of the scheme will take some time as it has been launched recently. The government will make necessary changes and modification is the official web page. Once the departments have been briefed, it is the task of the officers of the mass marriage organizing committee, in respective areas to verify the forms and prepare the list of beneficiaries. Once the list has been prepared, it is the responsibility of the official to get in touch of the candidates. Once the funds are released by the state department, the organization of the mass wedding will take place with the assistance of the NGOs. The accounts will be credited with the specified amount and the rest of the arrangements will be done by the organizing branches. On the day of the marriage ceremony, all couples will be wedded in presence of their friends and family. Then the allotted gifts will be handed over to them with best wishes for a happy married life. This is just a rough sketch of the action plan of the state. With the implementation of the program, the brides will be empowered and the state will be able to extend a helping hand towards the poor and the needy. As more people register under the scheme, the harmful effects of minority marriage will be eliminated.